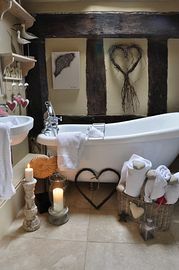 This fascinating property has been featured in Country Homes and Interiors Ideal Home and many more Interiors magazines as its owner is Kerrie Griffin-Rogers, Artist and Interior Designer, she has made this property into a talking point. You are five miles away from the wedding venue of Isycoed Park, just 30 minutes from Chester and Bangor on Dee race course is ten minutes away. The house is set in approximately 150 acres of rolling countryside up a private road. You are ten minutes from Ellesmere where for birdwatchers it is a must visit. 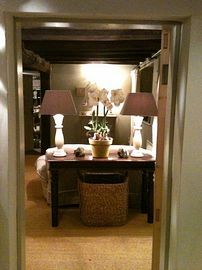 The rooms are creatively lavished with items from her interior company and her art. 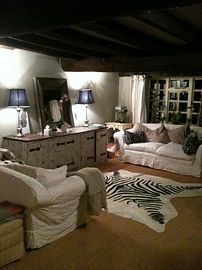 The rooms have beautiful beams, white bed linen sumptuous accessories and are painted in F&B Paint, a must with our owner. She sets a warm friendly atmosphere, attracting guests yearning for a bit of history and indulgence of the world of interiors and art. You have the wonderful old 30 foot lounge beams everywhere with tv and wifi for the duration of your stay and a private garden area. 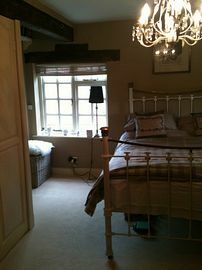 Beams and character to die for. 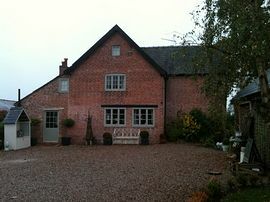 Situated between Whitchurch and Ellesmere you turn off for Breaden Heath passing through the very small hamlet on the outskirts you will find the farm house situated up a private driveway.